Think of your stomach as one big test tube. Maybe you drop in a vitamin or herbal supplement each morning. Maybe a cholesterol-lowering statin or a blood-pressure drug. Perhaps an infection-fighting antibiotic or allergy-relieving antihistamine. And you wash it down with fruit juice or milk or coffee. That may not always be a good thing because some foods and beverages - from chocolate and caffeine to dairy and alcohol - as well as dietary supplements (vitamins, herbals, etc.) and over-the-counter (OTC) drugs can interact with prescription drugs when they land in your gut. Those interactions may affect the ability of the drug to work as it should. Or that mix may cause unwanted side effects. With some tetracyclines, for example, you may need to avoid dairy products at the time you take the drug. If you take digoxin for your heart, you may need to steer clear of St. John's wort and large amounts of black licorice (that contains glycyrrhizin). Take ACE Inhibitors to lower your blood pressure? Go easy on high potassium foods such as bananas, oranges and green leafy vegetables. And depending on the statin you're taking - there are many different types in this class - you may need to avoid grapefruit. Such drug, food and supplement interactions become especially important as the number of drugs taken increases. Shiew Mei Huang, acting director, office of clinical pharmacology at the Food and Drug Administration's Center for Drug Evaluation and Research, cites a survey published in the Journal of the American Medical Association that found in the population 57 and older in the U.S., "at least 80 percent use at least one prescription drug. Half of them use OTC drugs. And some use dietary supplements." Says Huang, "What is important in that report is that almost 30 percent use more than five drugs. 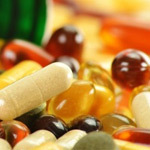 And among those who take a prescription drug, half of them take either OTC or dietary supplements. "It is the dietary supplements we have to be very careful (about)," she adds, and doctors need to be told about them. Hartmut Derendorf, a professor who heads the pharmaceutics department in the University of Florida's College of Pharmacy in Gainesville, might agree about the role dietary supplements play. "Sometimes they look alike and patients think they are medications like normal medications. But dietary supplements are not required to be investigated and tested with the same rigor," he says. Because your age, gender, medical history, etc. can affect how a drug interacts with other substances in your gut, "there are no general rules," says Derendorf. "The key is for patients to be very open, to work with their pharmacist and physician and tell them about the use of supplements and also look for the specific food interactions that are known for the medication that they are using." That's crucial because guidelines can change. The FDA regularly releases food-and-drug interaction consumer updates that are prompted by a variety of factors, Huang explains, including the recent grapefruit juice-statin update issued last month. So what should you use to help the medicine go down? Stick to a plain glass of water, say experts. Keep a record of all drugs (prescription, over-the-counter), vitamins and herbal supplements that you take. This FDA chart can help www.fda.gov/drugs/resourcesforyou (type "my medicine record" in the search field). Tell your doctor or pharmacist about all drugs (prescription, OTC) and supplements you take. If a doctor prescribes a new drug, ask the doctor or pharmacist if there are food interactions. Read drug information from the pharmacist; don't discard. The following websites offer guidelines, but check with your doctor: www.fda.gov/drugs/resourcesforyou (type "avoid food and drug interactions" in the search field; nclnet.org/health/146-food-drug-interactions druginteractioncenter.org and webmd.com/drugs.